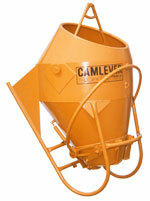 Concrete Buckets – Camlever has the right one for every job. Big Jobs, small jobs, tough, or unusual jobs… Camlever has the concrete bucket that will do it faster, better and cheaper. Camlever’s rugged lightweight tubular construction is 25% lighter than other concrete buckets and its variable-leverage gates are up to 9” larger than most, making discharging faster and preventing segregation. 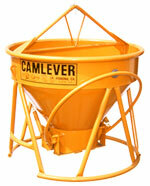 Camlever manufactures many styles of concrete buckets, each designed to excel in specific job applications. All of our buckets feature a rugged, high strength, light weight, tubular construction and the large, exclusive, Camlever variable-leverage gate that offers easier operator control, prevents segregation, and has a 4:1 mechanical advantage over other buckets. 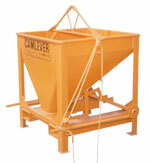 Low Boy Concrete Bucket – Low profile design makes for easy loading. Available in capacities from 3/8 cubic yard – 4 cubic yards. Extra larger 32″ available. Lite “N” Tuff Concrete Bucket – Built as rugged as a standard bucket with a 3″ smaller gate. Available in capacities from 3/8 cubic yard – 3 cubic yards. Camlever also manufactures trash material handlers, trash chutes, and recycling dumpsters that are unmatched in design and unsurpassed in quality and ease of use. Whether lifted by crane or forklift, these products are built with safety in mind and offer semi-automatic, single operator controlled dumping. A must have for any job site. 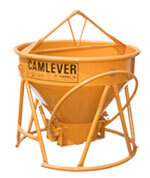 Camlever, Inc. was founded by John Harris who built his first concrete bucket nearly 50 years ago. John saw firsthand the need to improve the cumbersome and inefficient buckets as crane operator in the early 60’s. He designed the first easy to load, easy to pour, cam lever bucket for his own use but soon began receiving requests for his bucket from others. John’s concrete bucket was just what construction site supervisors were looking for – more efficient than any bucket anyone had ever seen. John had so many requests for his design that he shut down his crane and began building his first 100 concrete buckets with the cam lever gate. Job supervisors has started telling their crane operators not to show up on the site without a cam lever concrete bucket. John opened Camlever, Inc. on October 18, 1978, setting up shop at the corner of East End Avenue and Ninth Street, in Pomona, California. 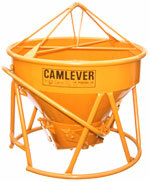 Camlever, Inc began manufacturing a complete line of concrete placing buckets and trash material handling equipment and has been manufacturing exceptional quality products for the construction industry now for more than 43 years. John’s production line, like his concrete bucket, is efficient. In every corner of his now three-acre shop, you will find his touch at work. Every workstation is designed to build buckets up to an 8-yard capacity with virtually no more effort than it takes to pull a lever. Welders never have to strain to reach awkward places, lift heavy pieces of steel, or move their equipment weld after weld. Ease, efficiency and thought was incorporated into the manufacturing as well as the design. Today, every one of John’s concrete buckets, trash material handlers, hoppers, handcarts, trash chutes, and accessories are manufactured from the ground up right on site, with the exception of a few nuts and bolts and a couple of rubber products. American-made with quality and integrity. 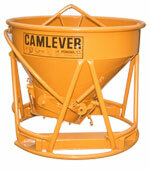 Gamka Sales Co. Inc is an Authorized Dealer of Camlever Concrete Buckets. Please call us at 732-248-1400 for assistance and placing your order.